Print presentations, PDFs, Web pages and reports at speeds up to 20 pages-per-minute for full-color or black & white documents. The system is ready in 25 seconds and makes its first black & white copy in 6.5 seconds and 9.5 for full-color. The Aficio MP C2030 offers one of the smallest footprints in its class, even when fully-configured. Print and copy strategic plans, training materials, market research papers and other documents with 600 dpi resolution. Distribute documents to remote offices quickly and easily with Super G3 faxing and 150 Quick Dials. 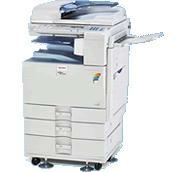 Or use LAN faxing to send faxes without leaving your desk. Scan spreadsheets, drawings and other large originals up to 11" x 17". Print and copy spreadsheets, newsletters and other documents that require 11" x 17" paper. Or use the Bypass Tray for full-bleed output of proofs and design layouts up to 12" x 18". Optimize productivity with a total paper capacity up to 1,600 sheets and a standard 50-Sheet Automatic Reversing Document Feeder. Create postcards, posters and covers for handouts with thick or unique paper. Tray One and the Bypass Tray both accept paper weights up to 140 lb. Index. Reduce paper consumption and filing space with standard duplexing. Take advantage of remote management. Monitor system details, settings, machine usage information and supply status from a standard Web browser. Track color consumption with user codes to eliminate the risk of abuse.